Feb. 1, 2016, 11:44 a.m. The Post and Amazon owner met with the paper’s staffers in a town hall meeting this morning. By Joseph Lichterman @ylichterman Feb. 1, 2016, 11:44 a.m.
Jeff Bezos doesn’t spend much time in Washington, D.C. or at the offices of his Washington Post, but that doesn’t mean he doesn’t mean he isn’t thinking about the newspaper he bought for $250 million in 2013. He regularly meets with editors and executives by conference call and in-person in Seattle, but Bezos said he uses some more personal time to think about the paper. 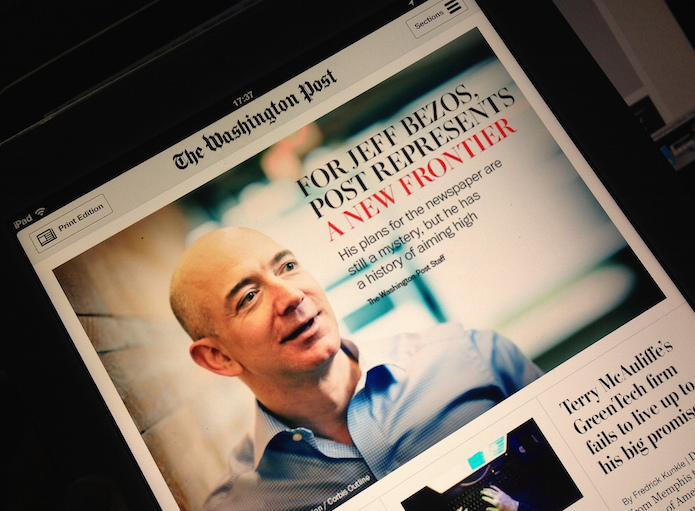 Bezos: "I spend a lot of shower time thinking about the Washington Post."
. @JeffBezos, definitely just visiting DC: "I don't know how you guys live here, honestly"
Luckily for us, journalists like to live-tweet events, so Post staffers gave us a play-by-play account of Bezos’ talk. Jeff Bezos: "To be the paper of record we need talent, money and patience and we have all three." WP reporter to Bezos: "How patient will you be with us?" Bezos: "I don't know anyone more patient than me"
Bezos: "My prediction is, [the Post] is going to be in investment mode for some time." Bezos says it's healthier for @washingtonpost to make a small amount of money on a very large group of readers than the reverse. Bezos: "Efficiency and exploration are in tension with each other. Wandering can feel inefficient. … I'm a big fan of wandering." The print product remains incredibly important to the revenue of The Post. … It's going to be here a long time. — Jeff Bezos. Bezos sees a 10, 20 year timeline for the print edition. Bezos on diversity at @washingtonpost: "You have to acknowledge it's an issue." But doesn't say much beyond that. On diversity issues today, Bezos has been very quick to acknowledge issues, and absolutely cut off all discussions of solutions. Photo by Esther Vargas used under a Creative Commons license. POSTED Feb. 1, 2016, 11:44 a.m.
Lichterman, Joseph. "Jeff Bezos on The Washington Post’s digital strategy, the future of print, and sending Trump to space." Nieman Journalism Lab. Nieman Foundation for Journalism at Harvard, 1 Feb. 2016. Web. 25 Apr. 2019. Lichterman, Joseph. 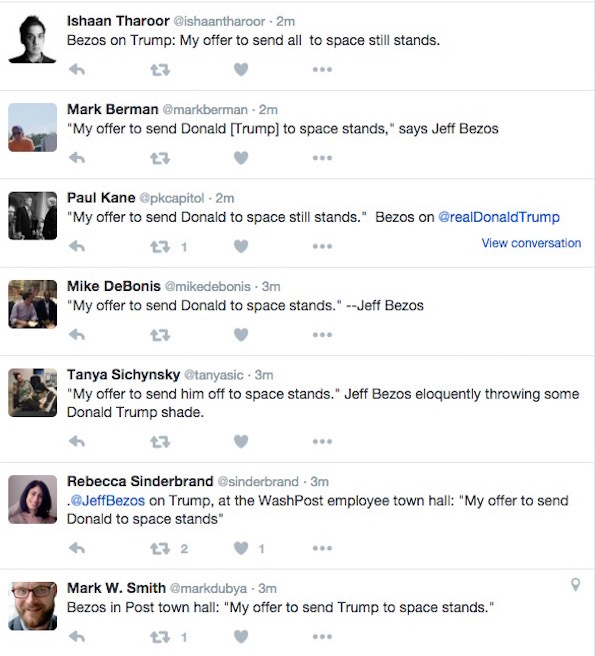 "Jeff Bezos on The Washington Post’s digital strategy, the future of print, and sending Trump to space." Nieman Journalism Lab. Last modified February 1, 2016. Accessed April 25, 2019. https://www.niemanlab.org/2016/02/jeff-bezos-on-the-washington-posts-digital-strategy-the-future-of-print-and-sending-trump-to-space/.